(*) PwD Quota : Persons with Disabilities (PwD) are eligible to apply for this recruitment. Help Line Telephone Numbers : ..
32 years for BC / BC Muslims / MBC / DNC candidates. 35 years for Destitute Widows of all communities. There is no age limit for Destitute Widow 10th Std Pass or higher qualifications. 10 years additional relaxations are available for Persons with Disabilities (PwD) candidates. Minimum age limit is 14 years completed. Candidates from Tamil Nadu and Pondicherry alone eligible to apply. Interested and eligible candidates may apply to the Secretary, Mahalakshmi Girls Higher Secondary School at the earliest. Post Graduate Teacher (PGT) Mathematics - 1 Post for UR Quota - Basic Pay 9300 Grade Pay 4800 in Pay Band II category - M.Sc. Mathematics with B.Ed. Post Graduate Teacher (PGT) Chemistry - 1 Post for UR Quota - Basic Pay 9300 Grade Pay 4800 in Pay Band II category - M.Sc. Physics with B.Ed. Post Graduate Teacher (PGT) Tamil - 1 Post for UR Quota - Basic Pay 9300 Grade Pay 4800 in Pay Band II category - M.A. Tamil with B.Ed. Interested eligible candidates are requested to apply, along-with all necessary documents duly self attested to the following address on or before the last date i.e. 7th March, 2017. The above post is in regular basis, hence, roster system and age relaxations are applicable as per Government of Tamil Nadu norms. 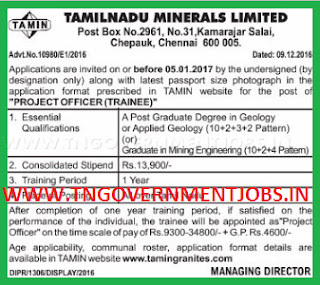 Interested and eligible candidates may forward their application form along-with all necessary documents to the Managing Director and Head, Tamil Nadu Road Infrastructure Development Corporation (TNRIDC), LLA Building, 4th Floor, 735, Anna Salai, Chennai 600 002 on or before the last date. The above vacancies are on contract basis appointment. Place of posting Spices Board Chennai. Ex-Serviceman : Length of Service plus 3 years. No fee for SC / ST / PwD candidates. Rs.100 for OBC / UR candidates only. Fee can be paid as Demand Draft in favour of "Airport Authority of India" payable in Chennai. Application cover must be superscribed as "Post applied for Assistant (HR)"
Age relaxations and roster system are applicable as per Government of Tamil Nadu norms. Age relaxation, is applicable as per government of Tamil Nadu. 10 years age relaxations are application as per government norms for Persons with Disability. The above OA post is permanent category vacancy. Interested and eligible candidates may forward their application form along-with all necessary documents to The Commissioner, Ellapuram Panchayat Union Office, Uthukottai Taluk, Thiruvallur District on or before the last date, i.e. 24th February, 2017. Cut-off date for age is 01.07.2015. Age 30 years for UR candidates. Age 32 years for BC / BC Muslims / MBC / DNC candidates. Age 35 years for SC / SCA / ST candidates. The above post are permanent category and regular basis. Interested and eligible candidates may attend the walk in interview along-with all documents on 3rd March 2017 to the following address. Work experience : minimum 3 years experience after the educational qualifications. All the above educational qualifications must be obtained through regular mode of study. All the experience qualification must be in full time basis. PSTM quota is available in this recruitment process. Examination will be conducted in April or May of 2017. Examination Centre : Chennai only. Negative marks applicable for each wrong answers in the basis of 1/3. Senior Officer Legal Post candidates should write additional one descriptive examination i.e. Preparation of plaints / counter and Preparation of Agreements / Deeds.